Why Is Native Advertising at the Center of Digital Advertising Today? Native advertising is a natural evolution of the traditional advertorial. What the idea behind an advertorial was, that of being written in the form of an article with the voice of the publication, is now being utilized in native advertising to provide more content and engagement for the consumer, allowing for more creativity beyond articles and conventional banners. The rapid growth of digital consumption has guided marketers down many avenues to reaching their target audience. The potential of newer technologies in digital realms is being realized, and marketers refuse to heavily invest in just one channel to influence their target audience. In 2013-2014, native advertising expenditures were 40% of the total digital ad spends among brands in the US. 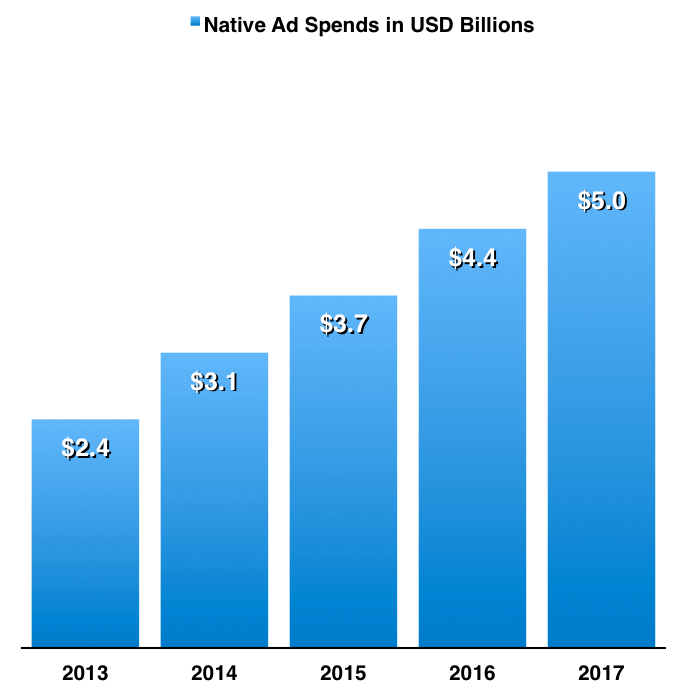 According to a survey conducted by Statistica, 2014 native ad spends have soared exponentially from the year prior, and the years prior to that, and they are projected to reach the $5 billion mark by 2017. According to Nielsen; 87% of American Adults are Internet Users. If your business decides to put serious effort in the combination of native advertising and content marketing, the reach and engagement levels of your audience can increase significantly. Remember, better content creates greater engagement! To know more about our native advertising solutions for your business, connect with us today. Have feedback? Leave a comment below, or visit or Facebook page to give us a review!